Opened in August 2016 after extensive renovations, this grand countryside estate has already received rave reviews and a string of awards from industry experts. Once graced by Queen Victoria, the Victoria Room (Grand Room) features the original bed, bath and basin used by the Queen! Don't miss the fine dining restaurant with signature menus by double Michelin starred chef Michael Caines. Your hotel is located on the edge of Snowdonia National Park, near the small market town of Bala. 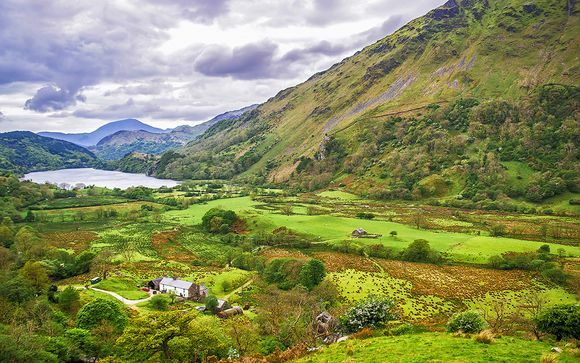 This beautiful area of North Wales is among the most stunning in the UK, with a diversity of countryside, including valleys, waterfalls, caves and wildlife. Snowdonia National Park offers endless opportunities for a huge range of outdoor activities such as hill walking, climbing, gorge-walking, horse-riding and mountain biking. Beautiful in any season, it is wild, remote and awe inspiring - the perfect antidote to city life! 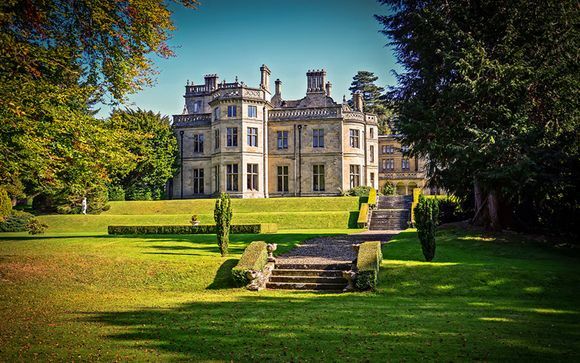 Less than a year after re-opening, this luxurious hotel has become the only AA five star property in North Wales, and one of three establishments in the whole of Wales to enjoy this rating. 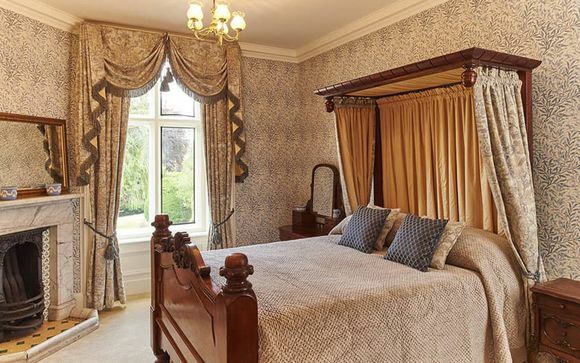 Owners Alan and Angela Harper have lovingly restored this grand countryside estate to impeccable standards, with a fine dining restaurant overseen by a Michelin starred chef the jewel in this regal property's crown. Queen Victoria spent ten days in residence at Palé Hall in 1889, and was so enchanted by the house and grounds that she changed her itinerary in order to extend her visit. Today, guests can be transported back in time for a taste of the royal life- the Victoria Room's original bed, bath and basin used by the Queen remain preserved, and are now complemented by sumptuous modern luxuries. Set in 16 acres of tranquil gardens and parkland, close to the River Dee, local activities include fishing, shooting and horse riding. Dogs are welcome here, so bring along your four-legged friend to explore the stunning woodland gardens and Snowdonia National Park. You may choose from a Classic or a Grand Room. Each room is individually styled and will be allocated on arrival. With lovely original fireplaces... as well as big windows with sweeping views over the grounds, (the rooms) are all gracious and, with the use of splendid beds, antiques and wallpapers from Zoffany and Sanderson, refreshingly like real grand country house bedrooms rather than hotel ones. Elegantly styled rooms, named after Welsh beauty spots. Each room has a beautiful view of the courtyard or the grounds, and the rolling hills beyond. 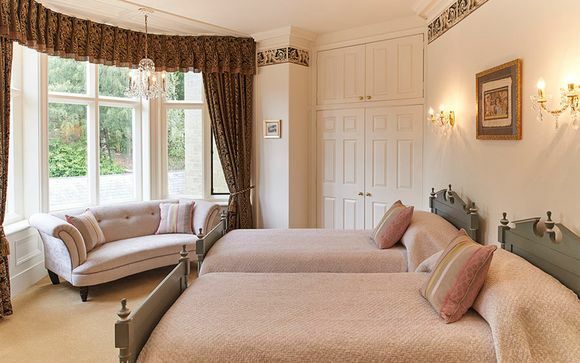 These more spacious rooms have some stunning standout features such as a luxurious bathroom with roll top bath or a four poster bed. Most have far-reaching views over the beautiful walled garden and across the Dee valley. This offer is based on a Bed and Breakfast stay or Half Board stay (8 course tasting menu and wine flight each day). Exquisite fine dining is at the heart of Palé Hall, with signature menus created by the renowned, Michelin starred chef Michael Caines, together with the hotel's Head Chef Gareth Stevenson. There are three different dining rooms to suit your mood and budget, from private dining in the cosy library to a romantic dinner in the elegant, Venice-themed dining room. Menus are focused on fresh, seasonal local produce - organic and humanely raised wherever possible. 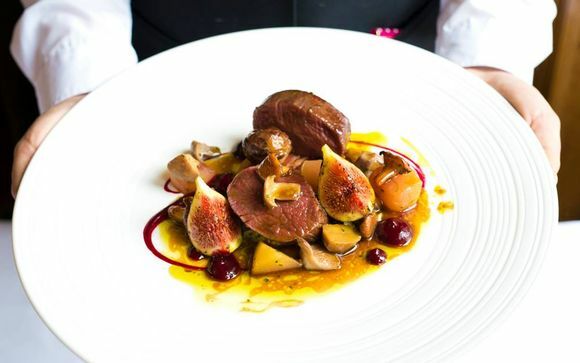 Expect classically British dishes with a Continental influence, such as seared duck liver with Yorkshire rhubarb, native lobster salad and Angela’s chocolate fudge cake. M54 then A5. Turn left just after Corwen on to the B4401 for 4 miles. After Llandrillo turn left at the Bryntirion Inn; the gates to Palé Hall will then be seen 100m on the right. Sat nav may guide you off the A5 at Knockin and along the Tanat valley. Beautiful, but narrow and mountainous, be aware this route might be best avoided at night or in poor weather. The train from London Euston to Chester is 2 hours 4 mins. Car hire is available at Chester station or the hotel can arrange a transfer. Chester station is 40 miles from the hotel.